ZaKIr hUSSaIN’S PUlSe of The World: CelTIC CoNNeCTIoNS In January 2011, tabla master Zakir Hussain and four accomplished Indian musicians, all regular collaborators of his, were invited to Scotland where they were joined by several Celtic musicians. After several days of rehearsing, sharing ideas and discovering common ground in their respective musical genres, they kicked off Glasgow’s annual Celtic music festival with an opening concert that was deemed by many to be one of the most successful in recent years. and recordings and performances with artists as diverse as George Harrison, YoYo Ma, Joe Henderson, Van Morrison, Airto Moreira, Pharoah Sanders, Billy Cobham, Mark Morris, Rennie Harris, and the Kodo drummers. His music and extraordinary contribution to the music world were honored in April 2009 with four widely heralded and sold-out concerts at Carnegie Hall’s Artist Perspective series. 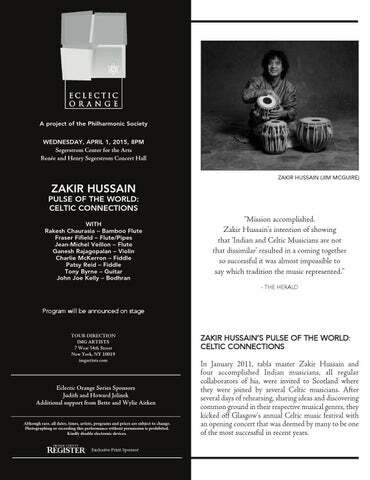 A multiple Grammy Award winner and the recipient of countless honors, Zakir has received titles from the Indian, American, and French governments, Grammys, and “best percussionist” awards from significant music journals. 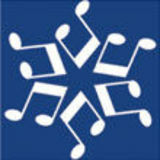 He has scored music for many films, events, and productions, including the 1996 Summer Olympics. He has both composed and performed with Alonzo King’s Lines Ballet (for which he received two Isadora Duncan Awards), YoYo Ma’s “Silk Road Project” with choreographer Mark Morris, and, with his oft-times collaborators and band-mates Bela Fleck and Edgar Meyer, with both the Nashville and Detroit Symphony Orchestras, under the baton of Leonard Slatkin. Zakir’s second concerto, Concerto for Four Soloists, a special commission for the National Symphony Orchestra, was performed at Kennedy Center in March 2011, conducted by Christoph Eschenbach. His third concerto, the first ever composed for tabla, will premiere in Mumbai in fall 2015, with the Symphony Orchestra of India. Edgar Meyer, and Joshua Redman. He has received many important awards in India, most recently the Pannalal Ghosh Puraskar in 2013. He has taken part in many prominent festivals, including WOMAD in Athens and the Festival of St.-Denis in Paris, and was invited to conclude the 24-hour live BBC Radio broadcast celebrating Queen Elizabeth’s Silver Jubilee. His special gift is the ability to preserve the purity and intensity of the flute in the midst of many instruments. The Bansuri, the bamboo Indian flute, is a magical instrument that is so ancient it is part of the mythology of many cultures; Krishna, Kokopelli, and Pan all played it. Rakesh is a worthy successor! fraSer fIfIeld, flUTe/PIPeS One of the more distinctive pipers in Scotland, Fraser is an uncommonly wide-ranging multi-instrumentalist, performing on various pipes, whistles, the soprano saxophone, Bulgarian Kaval, and occasionally on percussion. Perhaps that variety is why, as Jazzwise put it, he is “an outstanding product of the Scottish jazz-folk scene who at one moment can blow a low whistle like Charlie Parker steaming his way through ‘Ko-Ko’ and at the next knock out an air on a sax like a Highland traditionalist.” He’s released five albums of original music on his own Tanar label, has been commissioned by a wide range of festivals, the Scottish Arts Council, and the BBC, and performed from the U.S. to Azerbaijan with groups like Capercaillie and Afro-Celt Sound System, among many others. JeaN-mIChel VeIlloN, flUTe Though Celtic culture is associated with Scotland and Ireland, the region of France known as Brittany is Celtic as well. Jean-Michel Veillon was first a dancer and then a bombard (old type of double-reed oboe, typical of Brittany) player in his teens before moving on to the transverse wooden flute. His first influences were Irish, but he soon created distinct articulation techniques that reflected his Breton heritage. After years of touring the U.S. with groups like Kornog, Pennou Skoulm, Den, and Barzaz, he has become renowned for introducing the wooden flute into Breton folk music. In the words of the Welsh/British folk magazine Taplas, “If you have any interest in the flute, folk or otherwise, Jean-Michel Veillon’s recordings are, like Matt Molloy’s, indispensable.” GaNeSh raJaGoPalaN, VIolIN Violin entered Indian music perhaps 200 years ago, and in that time few have become more distinguished than Ganesh Rajagopalan. In the Indian tradition, he began his studies young, and was performing by the age of seven. He became famous in a duo with his brother Kumaresh, but has played extensively with a who’s who of Indian musicians over the years. He has worked with many greats, from Zakir Hussain to the Oscar-winning Bollywood music director A.R. Rahman to the legendary John McLaughlin. Charlie McKerron was born in London and spent time in Africa before his family returned to his father’s homeland of Scotland when he was five. By the age of 12 he was winning fiddle competitions, and after completing school he came to prominence as a member of Capercaillie, a traditional Celtic band from the Argyll area of Western Scotland. It began in a purely acoustic vein, but over the years achieved considerable fame by experimenting with various elements of fusion— funk bass, synthesizers, and the like. Charlie has also achieved acclaim for his ability to write new songs— “Bulgarian Red,” for instance—that have been adopted as part of the Scottish folk canon. A Dubliner, Tony has focused on traditional Irish music since leaving college in 1999, so his work with Matt Molloy and Lunasa will not be surprising. But he’s also crossed into somewhat different territory to play with Led Zeppelin’s John Paul Jones, the American dobro master Jerry Douglas, banjo king Bela Fleck, and the classical violinist Nicola Benedetti—quite a span! In addition to college teaching credentials in Dublin, he has worked with the Galway Arts Festival and has been a cast member of the award-winning play Trad, which has toured to the Edinburgh Fringe Festival as well as Australia. PaTSy reId, fIddle Patsy Reid is undoubtedly the most in-demand traditional fiddle player in Scotland. Just as she was finishing college (a 1st Class Honours degree from Strathclyde University), she co-founded Breabach, which was nominated as the best Folk Band by the BBC Radio 2 at its 2011 Folk Awards. Soon after, she began working with various groups, including the celebrated Northumbrian piper Kathryn Tickell, Dougie Maclean and Kylie Minogue, and in the studio with a passel of projects. At the 2012 Olympic Festival, she fell in with Zakir Hussain, and since then has visited India four times, collaborating with various South Asian musicians. Her percussive chopping style will be a prominent part of the tour. JohN Joe Kelly, BodhraN England’s The Guardian said of John Joe that he was “...surely the greatest living Bodhran player” alive, which pretty much covers it. He is certainly one of the most sought-after bodhran players on the folk music scene today. He is a member of Rook and the Mike McGoldrick Band, among others. Although a stalwart of the traditional scene, he is constantly expanding the boundaries of what one can get out a simple drum. In recent years he has been involved in many world music collaborations, with musicians varying from Tim O’Brien and Kate Rusby to Don Tyminski, and now Zakir Hussain.